The language called !Ka<tá, which is native to the falconiforms of Krisí’i’aid, is spoken as the planet’s lingua franca. All three species are physiologically capable of producing the sound system that the language requires, although among the ciconiiforms and galliforms vocal expression of !Ka<tá usually emerges in heavily “accented” form, with imperfectly enunciated musical elements. !Ka<tá can be loosely characterized as a tonal language, although it bears little resemblance to any such language spoken on Planet Earth. Prf. Ramonda Peders coined the term “musicophonetic” in order to categorize !Ka<tá because the language is a blend of three types of sound: those that approximate the vowels and consonants uttered by native Inge speakers, those that accrue meaning through variations in pitch, and those that are pure musical tones, unverbalized. Prf. Peders constructed the system currently used for transcribing !Ka<tá into recognizable Inge symbols. Two versions of Peders Transliteration exist: Full Peders Transliteration (FPT) and Simplified Peders Transliteration (SPT). !Ka<tá employs a true alphabet consisting of 37 consonants and 17 vowels; eleven of the consonantal characters render Inge phonemic clusters (e.g., ks, kr, st) while among the vocalic characters five render diphthongs and one renders a consonant/vowel cluster (ió, pronounced yo). In addition there are two “half-letters” (the trill [♪] and the warble [♫]) that are not included in the official alphabet, as well as symbols denoting pitch variations. Furthermore, the language employs a plethora of diacritical marks and indicators that lack consistent rules of usage; these have nothing to do with syntax but everything to do with connotation and expressiveness. FPT retains all these marks and indicators in order to allow a precise, scholarly interpretation of all aspects the language. Simplified Peders Transliteration, on the other hand, omits these attitudinal indicators, rendering only the symbols that are pertinent to syntactical understanding. Thus, SPT is the format employed in the work at hand in order to make it more layman-friendly. However, it should be made clear that, while the meaning of !Ka<tá can be accurately denoted by the use of SPT, the pronunciation of the text, along with many of its subtleties of connotation, is not fully reflected. The consonants and vowels of !Ka<tá are always enunciated as separate lists. There are no upper case characters. The names of consonants are vocalized with a sliding rising inflection, while the names of the vowels are preceded by a click and vocalized on an even tone. Here follows a list of the transliterated consonants and vowels and their approximate pronunciations. 13. !< whistle, a sustained non-verbal note of standard pitch. No absolute pitch exists for a whistle; it varies with the speaker. The trill (♪, a short sequence of two notes) and the warble (♫, a sequence of at least three notes) are called “half-letters” (♪u’íchit filitú) because, while they are in rare instances used as vowels or consonants integral to the word (as in khechi’írr♫i [to sing]), they are more commonly used as inflections (e.g., to form plurals and possessives), to construct adjectives and diminutives, or to express emotion. They can be vocalized in many subtly distinct ways to indicate emotion or emphasis and are frequently written with those special marks mentioned earlier that are omitted in SPT. For example, tuneful warbles of as many as eight distinct notes, almost amounting to a melody, can be used in certain emotional situations, such as courtship or danger. Whistles (transcribed as <) are regarded as true vowels. Only five variations are necessary to a literal rendition of meaning and so are included in the standard alphabet. However, the pitch and duration of whistles can vary greatly and only FPT retains the diacritical marks for these variations. Furthermore, such variations in whistles and all musical elements of the language are often idiosyncratic to the speaker, or they can reflect regional differences (dialects). The following tonal indicators affect the vowels of preceding syllables. ↑ The entire preceding syllable is pitched a third above normal neutral speech, as in the Captain’s name <Imatú↑. When applied to whistles, the symbol indicates an upward sliding tone. ↓ The entire preceding syllable is pitched a third below normal neutral speech, as in the word imitú↓ (grub, caterpillar). When applied to whistles, the symbol indicates a downward sliding tone. ↑~ The entire preceding syllable slides up a third from normal neutral speech. ↓~ The entire preceding syllable slides down a third from normal neutral speech. ↔ The preceding syllable is drawn out temporally, producing a sound roughly twice the duration of the penultimate syllable, e.g., u’ízi↔ (hour). ´ An acute accent mark over a vowel indicates that stress (prominent relative loudness) is placed on that syllable. ’ In !Ka<tá, an apostrophe is inserted between two adjacent but distinct vowels to indicate that the combination is not a diphthong (e.g., oik↑~ [river] and o’íkh [matter or substance]; tsai [why] and tsa’í [three]). This symbol also can stand for a schwa [ə], used mostly in transliterating Gro’at and Towewa (the schwa does not exists natively in !Ka<tá).
] Period mark; one of only three marks of punctuation used in the !Ka<tá language. It is placed at the ends of sentences. ⇞ Exclamation point; one of only three marks of punctuation used in the !Ka<tá language. This symbol is an approximate reconstruction of the mark actually used. It is placed at the beginning of sentences. | The third mark of punctuation used in the !Ka<tá language. It is equivalent to a comma or a semicolon; as such its use is sparing and inconsistent. It is also used to join two halves of a compound word. Nei achú I need. Second conjugation infinitive khe’achú’i (to need or to require). All infinitives begin with the syllable khe-. The three classes of conjugation end in -a, -i, or -e, respectively. hwe tsaitú a signal. This phrase incorporates the indefinite article hwe. The noun tsaitú derives from the root tsai, a rendering of verbal information. The suffix -tú means a thing with the quality of the root. <an in order (to), for the purpose of (always followed by infinitive). Pronounced with a standard whistle preceding the syllable an. khekaw’i to show or demonstrate. Second conjugation infinitive, demonstrating the use of the apostrophe to separate adjacent discrete vowels. fi that. This relative pronoun is never omitted as it is in Inge. ♫go ♫ihulolda <↗nok you are receiving. Pronouns of all cases are rendered plural by suffixing a warble (♫); likewise all plural verbs are preceded by a warble. The third conjugation infinitive khe’ihule means “to get, receive, or obtain.” The word nok preceded by an upward sliding whistle is inserted following the verb to signify the progressive aspect. ♫nei♪ our (first person plural possessive pronoun). Possessive pronouns are formed by suffixing a trill to the nominative case. ♫hu!^tei’ák] transmissions. Plural nouns are formed by prefixing a warble. This word illustrates l) the beak snap (!) as an integral consonant; and 2) a use of the chirp-vowel (^). Note the presence of a bracket at the end, the mark of punctuation indicating the end of the sentence. ⇞Psa∙] This epithet, signifying roughly “Hell!” or “Damn!”, illustrates the use of the exclamation mark (⇞) and of the cough-consonant (∙). ♫nei ♫oi’atim khe’ena↑~ta we could (i.e., would be able to) understand. The irregular verb khe’astu means “to be able” and is always followed by an infinitive. The verb form ♫oi’atim is the conditional mood in the first person plural. In the infinitive khe’ena↑~ta (to understand) the third syllable is pronounced with an upward sliding pitch. !i tsurotai↑ The language. No noun in !Ka<tá is ever used without an article, unless some other defining word such as “some” or “many” is associated with it. The definite article is pronounced [beak-click] + i. There is also a generalizing article (hi) used with non-specific nouns, such as “Language (Hi tsurotai↑)is universal.” Both articles take number. The word tsurotai↑ concludes with a syllable that is pronounced on a distinctly higher pitch (without an upward slide). i’úta’úta♪ of each other. i’úta is a noun meaning “other” or “other one.” The idiomatic contraction i’úta’úta means literally “other-other.” A suffixed trill makes a noun possessive just as it does with pronouns. I just posted Conlanging for Beginners on my termitespeaker blog. I didn’t put it here because in general more people view my other blogs and because comments are enabled there. Hope you’ll take a look! In Chapter 2 of Volume Two of The Termite Queen Ki’shto’ba Huge-Head confronts the Star-Beings and challenges them to single combat. The following is the text of that speech as Kaitrin Oliva transcribed and later translated it. Strange Ones, I address you! I am Ki’shto’ba Huge Head, of To’wak, Champion of the fortress of Lo’ro’ra. We are the Shshi of Lo’ro’ra and if we must, we will fight you to keep our fortress safe. And yet I call the Challenge in the name of Lo’ro’ra’s Holy One and King: Let there be honorable single combat so that the deaths of many can be avoided! Send out your Champion, Strange Ones, and alone I will fight it! If I prevail, then you must go away and leave Lo’ro’ra in peace! Strange Ones, I speak to you! I am Ki’shto’ba Huge Head of To’wak,Champion of fortress of Lo’ro’ra. and if we must we will fight you to keep safe fortress our. Send Champion your forth, Strange Ones, and alone I will fight it! If I prevail [win], then you must go away and you must leave Lo’ro’ra in peace. * These constructions employ the modal auxiliaries thi| [must] and fro| [may] in idiomatic constructions. I’ve now published the first volume of this series, which tells of the epic adventures of the Shshi Champion Ki’shto’ba Huge-Head and his Companions. “The War of the Stolen Mother” retells the legends of Troy in the context of a giant termite civilization. The book is available in paperback and on Kindle at Amazon and also on Smashwords for other e-readers like Nook and Kobo. I decided I ought to bring the conlangers up-to-date on what I’ve published so far. I haven’t posted anything here since May 2o, so it’s about time I did so. I’ve now published three volumes. (These links will take you to all my books on Amazon and on Smashwords.) “Monster Is in the Eye of the Beholder” is an SF novella incorporating an older version of one of the major characters in the “The Termite Queen”; it has no developed conlang, but it does have a naming language. 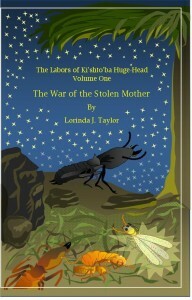 As for “The Termite Queen” itself, both volumes have now been published. The paperback versions present both the Shshi and the !Ka<tá languages as I intended them to look, with the Wingding symbols intact. The Kindle versions worked fine with !Ka<tá, preserving the musical notes that stand for warbles and trills, but I substituted the syllabic variants for the Wingdings. That isn’t really wrong – it just doesnt look the way I intended it to look. The Smashwords versions works fine with the syllabic substitutions, but it wouldn’t take the musical notes or the mathematical operator ∙, which stands for a cough. It substituted question marks for these. However, I went ahead and published those versions anyway, because it does make the text available for people who have e-readers other than Kindle. That’s where things stand at the moment. 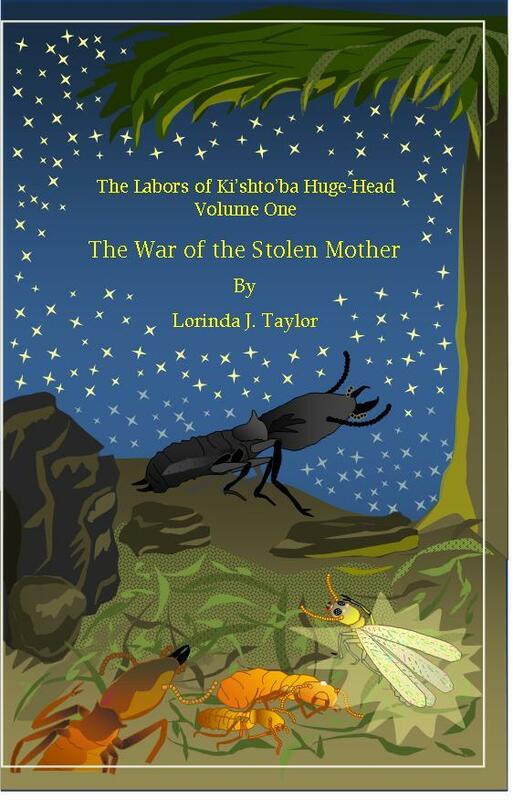 I’m currently working on formatting the first volume of “The Labors of Ki’shto’ba Huge-Head,” entitled “The War of the Stolen Mother.” (See cover art at head of this post.) Since these stories are entirely about my termite people, there are lots of language references, including information about the additional termite languages that exist on that planet. They should be of considerable interest to everybody who appreciates both conlangs and concultures, and they are rousing good stories to boot. The Shshi have no real mathematics. Although they are great builders, their engineering skills are instinctive – a genetic heritage from their days as tiny isopteroids. The members of the Builder Caste are all blind – they make all their blueprints in their heads, with some occasional help from the Alates, who have eyes. Therefore, their numbering system remains primitive and based on physiology. Individuals have antennae with 18 segments; their mouth palps have six segments, and they have six legs. Consequently, they base their numerical thinking on sixes and they have no numbers beyond 36 (the “two-antennae count” as they put it). After that, they might say “twice the two-antennae count,” but they are more likely to say simply “many” or “much,” which is expressed by reduplication (e.g., “many stones”: shka’zi| shka’zi|) or sometimes by the use of no’no’il| (adverb meaning “very large”) (e.g., “he speaks much [a lot, a great deal]: ma’gano| no’no’il| || To the Shshi (whose average lifespan is 20-25 years) anything older than the Mother (36 years is pretty much a maximum age for a Queen) is simply mysterious ancient history. Third: son’zi|, da’zon|, son’zil|, etc. This will be a catch-all post where I can periodically add information on vocabulary and provide lists of words. I’ve never written enough text in the language to need much slang. The one curse word that the Termites use all the time is tha’sask|>||, which means “damn!” with > functioning as an emphasis marker, i.e. an exclamation point. Another word that could be considered colloquial is da’roit’um|, “infatuated, smitten with hero-worship,” literally, “twist-headed.” Thus, in the first volume of “The Labors of Ki’shto’ba Huge-Head,” when the little Worker Twa’sei begs to go with the Champion on its quest, another character says, “Twa’sei is da’roit’um|,” meaning infatuated with the big Warrior. ta’ma’zei|: he-she-person, i.e. a person displaying sexual pheromones (the Alates). wei’ta’ma’zei|: “non-he-she-person,” i.e. a neuter individual (all Warriors and Workers). The word for “color” is han|. A degree of color is usually indicated in the manner of the word “pink,” by prefixing kom (pale or light in color) or mat (black, dark) “Gray” is an exception; it has a word of its own. weio’so| is “dead body or corpse”; weio’so’mi| is the Charnel Hall, or “corpse-place,” and weio’so’zei| is “corpse-person,” i.e., the name of the Subcaste of Workers who take care of the disposition of the dead. All nymphs look nearly identical when they hatch; their ultimate Caste cannot be determined. Therefore, the Namer Alates give them one-syllable names, like Kri (leg), Shra (flowers), or Tei (eye). At third molt, when their adult Caste is revealed, a suitable imago (adult) name is conferred, incorporating their nymph name. A Worker gets a two-syllable name, like Ti’shra (Sweet Flowers) or No’kri (Big Leg). The only people with five-syllable names are the breeding pair, the Mother and the King. When a new Mother is installed, the fortress’s Seer has the privilege of naming her. Thus, the Mother of the fortress of Lo’ro’ra bore the Alate name of Mei’a’kha’bu (Rain on Blue River) and the Alate who was Seer at the time the fortress was founded named her Ahk’a’ma’na’ta (Blue Mother). The King of Lo’ro’ra is Sei’o’na’sha’ma, which means basically Tree King. All female progenitors’ names end in ma’na’ta| which is the word for Mother or, in our usage, Queen. It means literally “he-holy-she,” with a derivation that is lost in time but probably refers to the fact that the Highest-Mother-Who-Has-No-Name ate her King and thus he became part of herself. na’sha’ma| means “King.” Again, the origin is somewhat obscure; the literal meaning of the three syllables is “holy-you are-male” although the possibility exists that the waveform designated “sha” could have been corrupted from some lost root. Fortress names are generally pretty straightforward. Thus, Ki’shto’ba’s home fortress is named To’wak, which means Destructive Mandible. Kwai’kwai’za means Many Hills (kwai|: mountain; za|: little – plus reduplication to indicate Many). And our fortress of Lo’ro’ra (lo’ro’ra’mi|) has a rather more obscure meaning; the four syllables mean literally Strong-Holding-Flower-Place, which usually is construed as Strong Land of Flowers, or Strong Flower Fortress.